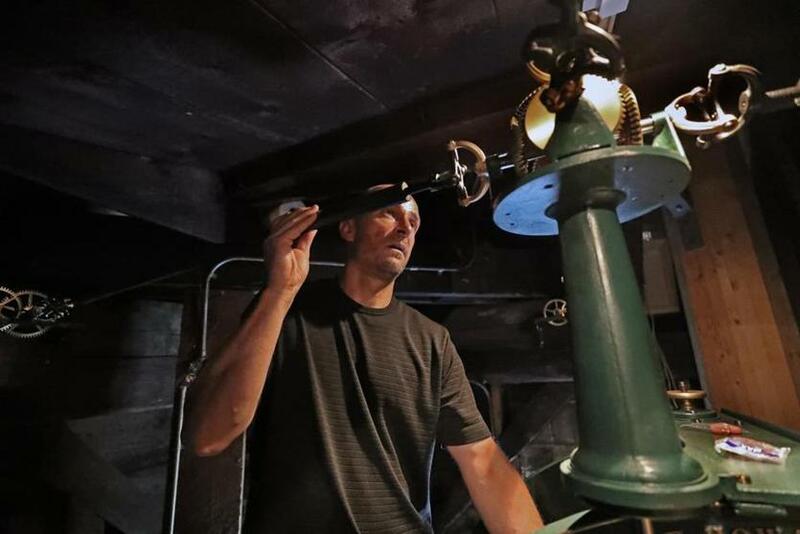 Kevin Rowe has to turn the crank handle 27 times to wind the 19th-century clock in Hingham’s New North Church. 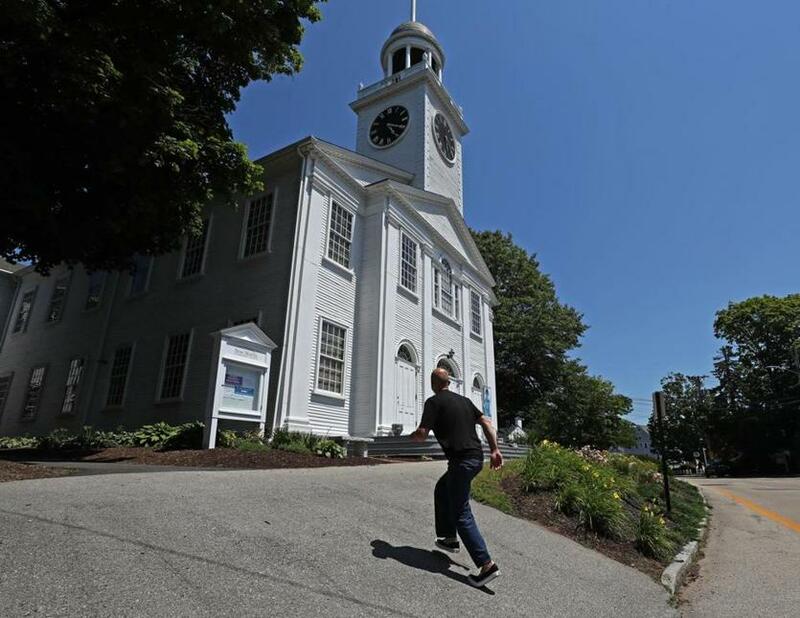 When the alert arrives, Rowe drives two minutes to Hingham’s New North Church, climbs four flights of stairs, puts his earplugs in, and turns a crank to wind the mechanical clock. 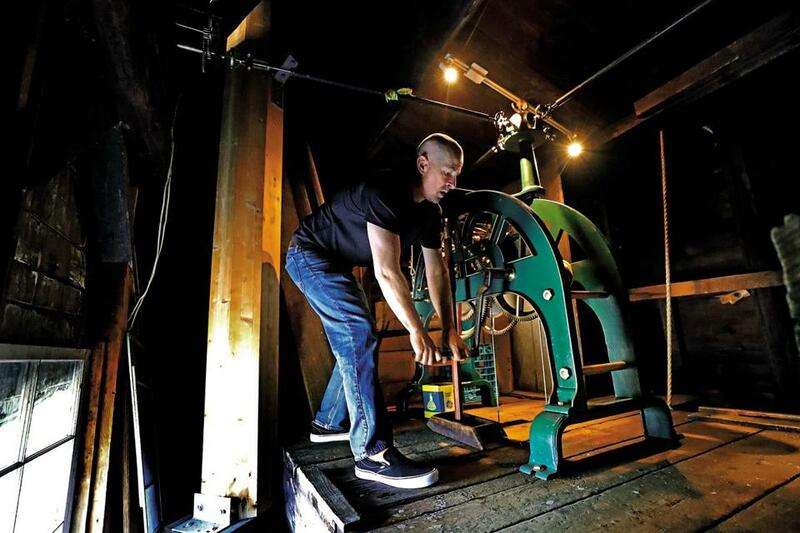 Rowe, 46, also known as the keeper of the clock, has been winding the clock for 10 years now, after his former father-in-law passed the job on to him. The clock, manufactured by local clockmaker E. Howard & Co., is a “heavy-duty machine,” Rowe said. And winding it? “There’s not much to it,” he said. He turns a handle 27 times, enough to lift five plates that weigh an estimated 100 pounds each all the way through the steeple. This sets the clock to strike the church bells every hour. He wears earplugs to protect his ears from the loud sound of the cranking. Then he uses his iPhone to check the time, and adjusts the hands of the clock accordingly – a modern twist to an old-fashioned system. When Rowe noticed the clock was consistently unable to keep the correct time, he asked town leaders to repair it. That request blossomed into a community effort to restore the late 19th-century clock. Rowe climbs up inside the steeple every eight to 10 days to wind the clock. Twelve Community Preservation Act projects were approved that included the restoration of four town clocks, the church’s website said. The New North Church was first on the list. The restoration process was a “herculean effort,” according to Andrea Young, an administrator of the Hingham Historic Districts Commission. Young said the clock was important in the early 1800s when the church was built because it was the town’s only way to tell time, but today people are not dependent on it. Following the repairs — which were done by brothers David and Ross Hochstrasser — Rowe no longer has to oil the clock parts, a chore that every previous clockwinder had performed. “It’s gorgeous now,” said Rowe, who also winds the clock at Dependable Cleaners in Hingham Center, a building that used to be the William Fearing schoolhouse. Rowe said he is not affiliated with the church but thought it would be a “neat” thing to do and a “cool” way to get more involved with the town. Rowe makes sure to wears earplugs to protect his ears from the loud sound of the cranking. Katie Camero can be reached at katie.camero@globe.com. Follow her on Twitter @camerokt_.